On deadline day for doing arbitration contracts, MLB beat reporter Jamal Collier did a mailbag. Its been a notable week with more Bryce Harper rumors and the Nats running their payroll right up to the limits of the Luxury tax cap with the Brian Dozier signing. Q: Harper is on my mind. Spring Training is days away. Aren’t the guys worried about will happen? No way they can be just “whatever,” right? Especially if he ends up in Philly? 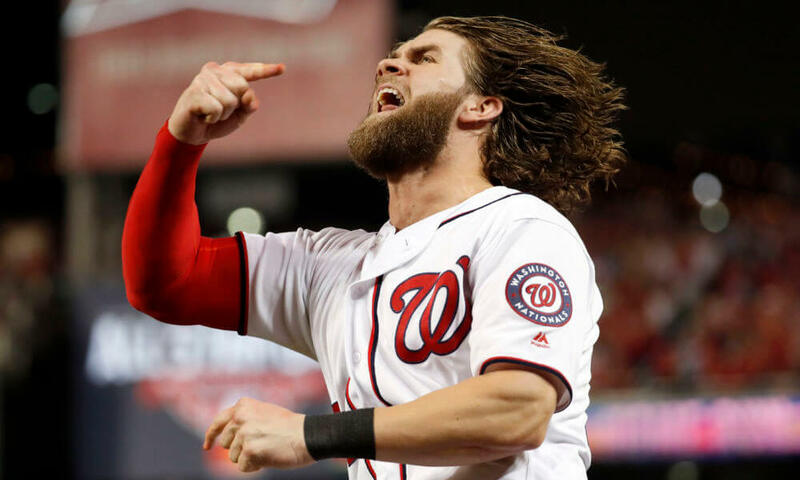 A: If they can’t figure out from the slew of Mike Rizzo moves what the team’s intention is with Bryce Harper by now … well maybe a sledgehammer would be more subtle. Its mid January and Rizzo has made 8 moves that should impact the opening day 25-man roster and another 2-3 that may be impactful down the road. He’s now got the payroll north of $190M. So what if he goes to Philly? I think the whole “don’t trade within the division” is nonsense. Yeah we’ll see him a lot. But its a closed loop; he has to go to one of the 30 teams in the league, and we are bound to see him no matter who he plays for. There’s 30 teams, and only half of them are even frigging trying to win right now, and then halve that again for those who even have payroll room to compete for Harper (or Machado). And Philly is one of them. They are his fellow union members and want him to get every dollar possible because their union so royally screwed them selves in the last couple of CBA negotiations. Collier notes that his fellow players know this is “part of the business” that Harper may eventually leave, and that he’s been a national figure since he was 16. 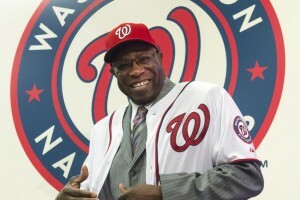 Q: If Harper re-signed with the Nationals, how would they work the outfield? Would Victor Robles start the season in Minors? Or would they trade Eaton? A: You’d have to trade Adam Eaton. And you’d be trading low. You can’t move Juan Soto … he’s making MLB Min and could be an MVP candidate. You really shouldn’t move Victor Robles; he’s supposed to be a *better* prospect than Soto, so you’re hoping for 4-5 win performance for (again) MLB min salary. These are the kinds of players you keep when you’re trying to win. Putting Robles in the minors would be an absolute waste, and if that was their plan then i’d advocate attempting to flip him as a centerpiece for a top 20 player in the league (like a Corey Kluber or something). Q: If Harper returns, how does it change how the team will handle Anthony Rendon negotiations? A: Hmm. That’s a good question, because despite the fact that Anthony Rendon dropped in the draft over injury questions he’s actually been pretty solid as a pro. I liken Rendon’s reputation and capabilities to Adrian Beltre; fantastic defender, sneaky good at the plate, and suddenly you look up and he’s put up a hall of fame career. Will that translate into a $200m salary? Probably not. 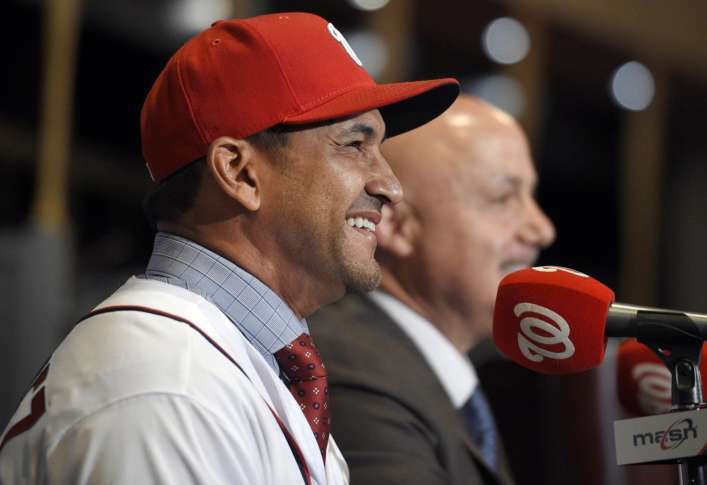 But Rendon is no dummy, and neither is his agent Scott Boras. 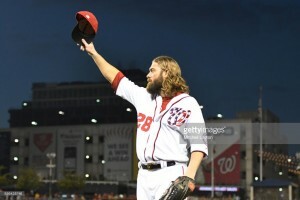 That being said … can the Nats do this whole “stars and scrubs” thing for ever? If you have 5-6 guys on high 8-figure salaries (Scherzer, Strasburg, Corbin, Harper, Rendon) can you put a good enough team behind them? I personally think Rendon is an incredibly important player for this team, even if he isn’t that high a profile. And because he’s not high profile, I think you can get him for $20M/year or something like that on a longer term deal, which would be a steal value-wise. I hope committing money to Harper doesn’t close the door on a Rendon negotiation. Collier says …. he has no idea, nor does Rizzo. Q: How should we look at 2019 Dozier replacing ’18 Daniel Murphy? Both are above-average offensive second baseman with liability at fielding. Is this an upgrade, downgrade or equal move? A: Absolutely an upgrade; Daniel Murphy had negative bWAR last year while even playing through injury Brian Dozier contributed. If Dozier is healthy and performs at his 2015-2016 level again … watch out this is one of the steal signings of the off-season. Collier basically agrees and gives good contextual numbers. Q: Do you think Washington will add a starter? If it does, I think Wade Miley is fine. A: I think they will … but not a guy to replace Joe Ross in the rotation. I think they’ll be looking for MLFAs with 5/1 or 6/1 buy-outs, like Edwin Jackson or Tommy Milone signings last year. I can’t see them breaking the luxury tax for a 5th starter. Collier agrees, remembering that the team has already signed Henderson Alvarez for just such reasons. 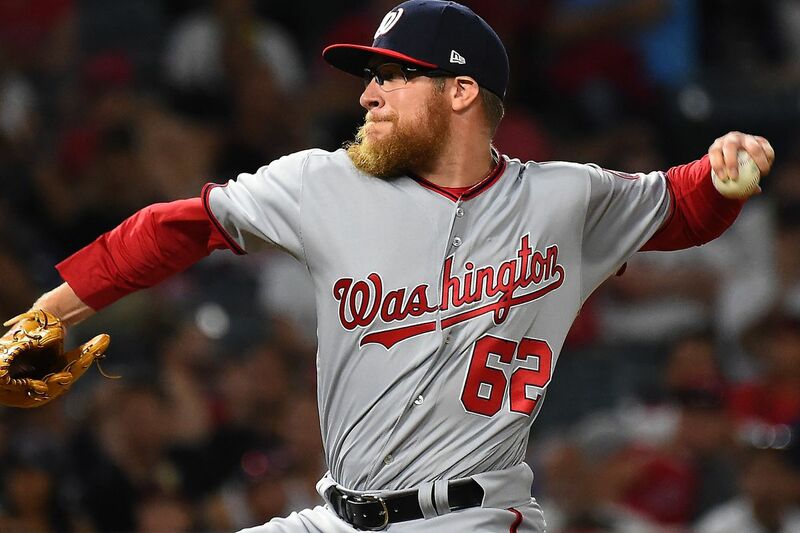 MLB Nats beat reporter Jamal Collier did another mailbag last friday … which came out before reports about what Nats turned down for Bryce Harper at the trade deadline. RHP starter and 2017 1st rounder J.B. Bukauskas, who had matriculated to AA by the end of 2018 and is a DC-area native. So, let me get this straight. The Nats could have gotten a much, much needed nearly MLB ready 1st round starter, a guy who looks like he could very well step into the 2019 starting Catcher conversation, and a third prospect instead of what they will eventually get for Harper (i.e., a pick between the 4th and 5th round in June 2019)? You can call this revisionist history if you want. But this report makes me sick. It was clear in early July they were in trouble. On July 26th their #2 starter Strasburg went back on the D/L and left an already struggling pitching staff relatively decimated. They were 50-51 and thus needed to go 40-21 from that point to get to 90 wins (which, as it turned out, was precisely what they needed to win the division). And the team turned down this package only to dump everybody just a couple weeks later. I mean, Mike Rizzo still has a job, so to me this was an over-his-head decision. Well fans, ask yourself how you feel now bout the entirely of 2018 at this point and the decisions they made from the first week of the season to the final trade of FAs to be in mid August. Q: What are the odds the Nationals do the smart thing and sign everybody else they need before Bryce signs somewhere else rather than after? A: Slim. If the Nationals spend all their FA money before the Harper-bazaar gets going, then Scott Boras doesn’t have his baseline 10yr/$300M contract to use as leverage with other teams. And as we’ve seen time and time again, the Nationals ownership seems to exist to enable Boras, hire his cast offs, give him his record-breaking contracts and generally serve to make sure Boras Corporation continues to gain new customers. Here’s what’s going to happen: the Nats will hem-and-haw, miss out on all the top Starters, miss out on a Catcher, basically do nothing but acquire middle relievers (they’ve already got two there) and 1 year corner sluggers to provide cover for Ryan Zimmerman, all the while having daily breathless media reports about their negotiations with Harper. What *I* want them to do is to be aggressive, assume Harper is going to Chicago or New York or Los Angeles liks we always though he would, and spend his salary fast and swiftly. But this is not Rizzo’s team; this is Lerner’s team, and we’re beholden to that ownership group and their idiotic decisions. Collier points at the Barraclough and Rosenthal signings as evidence that Rizzo will make moves. I don’t buy it. A $6M reliever coming off of injury is one thing; a $20M starter with significant competition from other teams is another. Q: If Bryce is re-signed, how does the outfield shake out for next year? Or does he play first base? A: If Harper signs, the team moves either Eaton or Robles (likely Robles since Eaton’s two injuries in two years has destroyed his value) to acquire a position of need (SP, C, 2B). Will Harper play 1B?? What a dumb question. This team has been bending over backwards for Ryan Zimmerman for years now; what makes you think anything changes for 2019? Zimmerman isn’t riding the pine. Harper, in theory, is a 26yr old athlete in his absolute prime of athletic ability. As others have noted, he appeared to be “dogging it” in the outfield last year, which contributed to god-awful defensive stats. But in years prior he’s proven himself to be more than elite defender, with one of the top outfield arms in the game. Maybe the security of a long term contract enables him to return to form. But he’s 10 years from being the kind of immobile player to waste at 1B. I mean, Zimmerman is only there because he’s forgotten how to throw across the diamond; he’s still an excellent range defender. Q: What’s a fair expectation for Victor Robles next season? Harper signs elsewhere and Robles plays a full season of CF for this team, hits 6th in the order right after Anthony Rendon, posts an .830 OPS figure, threatens 20/20, puts up nearly 4 bWAR or perhaps more if he’s really as good defensively as advertised and is a Rookie of the Year finalist. All for about $575k in salary. Harper signs here for $30M/year and the team has to move Robles. They can’t move Eaton b/c they’d be selling low, and they’d be completely morons to move Juan Soto. So its Robles out; he goes onto star for some other team (Miami?) and becomes a force of nature for 6 years for some other franchise while we get like 2 years of some veteran player and play a different “what if” game related to a hamstrung payroll and an aging team. Can you tell which way I want this to go? Collier kinda says, well he could be good, no idea which team. 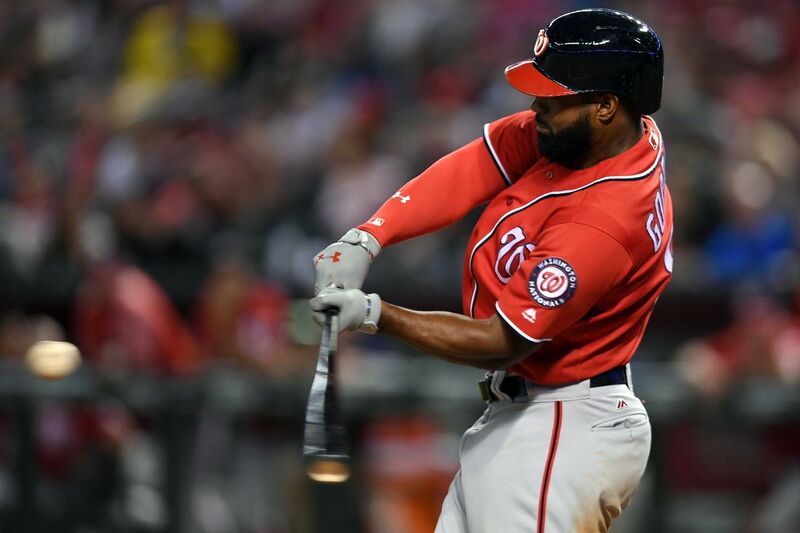 Q: Should the Nats be looking at a second baseman/utility man (a Josh Harrison type) given the lack of production at second and the unknowns of Howie Kendrick‘s rehab? A: I think Josh Harrison might be an excellent piece. I’m more confident of a Kendrick return than others. So my answer is kinda like this: there’s a slew of good 2B on the market and I woouldn’t mind getting one of them … but for me its priority 3 of 3 in terms of major acquisitions for this off-season. I’m ok going to war with Kendrick as my starting 2B and 7th hitter. HE had a 112 OPS+ in 2017, 110 in 2018 before getting hurt. That’s fantastic for a 7th or 8th hitter (depending on what we get for a C). Collier notes that Rizzo has been on record saying he’s ok with 2B too. So we’re in line. Collier also notes that there’s two significantly good prospects coming up soon in Carter Kieboom and Luis Garcia, both of whom could play 2B and one of whom (Kieboom) was in the AFL getting some time at 2B, perhaps in preparation for a mid-season callup to do just this. Q: Do you feel it’s more realistic for the Nats to address an everyday catcher via the free-agent market or via a trade? A: Usually the answer here is trade, since the FA market will bid up services of good players and thus you overpay for what you get. If you can even get them. FA signings just cost money. Trades cost players. This team has been shedding players for a long time in pursuit of playoff glory … and this off-season are in a great position to use MONEY to get players and not shred their depth any further. I think they should go after Yasmani Grandal hard and make him their starter for the next 3 years, and then should focus heavily on developing a catcher from within from the draft or from somewhere. Collier says FA is more likely. Sorry for Radio Silence/its the Over-reaction Season! First off, welcome to the 2018 season. Sorry for the lack of material here; its been a heck of a spring. Shifting priorities and a job transition that included basically four months of overlapping tasks has sapped all my spare time. Thanks for keeping the conversation going. Today marks the official end of the main source of time issues … so perhaps starting in the coming weeks i’ll be able to return to all the “fun stuff” that I like to talk about. Minor league pitching staffs, opening day trivia, starter rankings, nats prospect rankings/farm system rankings analysis, etc. We’ll get there. In the meantime, inspired by Keith Law’s frequent answer to questions in his chat yesterday, lets have some Over Reactions to the first few games of the season. A.J. Cole‘s first start debacle; disagree with me if you want, but was anyone really, really that surprised by his dud of a first start? If you want to tell me that its just one game, SSS, yadda yadda … then what in his previous time in the majors gave you any impression that he had turned a corner? I didn’t get a chance to post about it, but the signing of Jeremy Hellickson to me was a sneaky awesome move .. i absolutely think he can and will slot into that 5th starter spot and give much more competent starts for the big league team going forward. 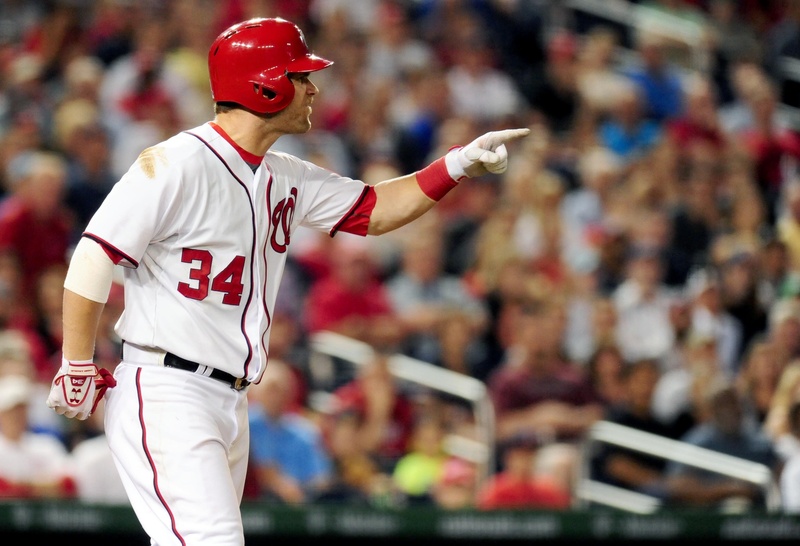 Ryan Zimmerman‘s slow start. I have literally never heard of a player who “took off” the entirety of Spring Training like he just did. Now he’s just 3 for 22 and has gotten sat twice in the season’s first week. WTF is going on? I am firmly in belief there’s some unannounced injury issue there that the team for whatever reason is being silent about. Koda Glover‘s shoulder. Is Glover the new Christian Garcia at this point? He’s now on the 60-day D/L… is he gonna come back off? Adam Eaton‘s ankle. Hmm … considering the irony that the Nats traded not one, not two but eventually three guys who could have eliminated the entire A.J. Cole situation to acquire Eaton … and that he’s played a grand total of 29 games in a Nat’s uniform … any injury, even if minor, seems like a cause for concern. Catchers. our three catchers are now a combined 3-22. I realize its easier to focus on the negatives (above) than the positives (Bryce Harper‘s monster start, the other four starters excelling thus far, Eaton’s great production early). But hey, its also conversation starters. So which of these 5 issues above is really something you’re worried about at this stage? Are you worried about nothing because its 7 games in and nobody should over-react to anything? If I had to rank my 5 issues in terms of worry for me right now, not even being realistic and acknowledging that its still early, blah blah, i’d probably go 1,2,5,4,3. How about you guys? Anybody go to opening day? We had SRO tickets but bailed when it looked like the wind chill was going to be in the 30s. A nice little surprise just before the Turkey day weekend: an ask Jamal Collier post on mlb.com. Q: Would you consider trading Harper? I am one of his biggest fans, and I know the desire to win next year, but would the return be worth it in the long run? A: Forensicane; don’t bother reading this next answer, because you’re not going to like it. Not only that, but lets say for the sake of argument that the Nats WERE willing to trade Harper. He’s got one year of control left. He’s set to make north of $20M in 2018. He’s an injury risk. And he’s absolutely going to Free Agency. How much does anyone really think he’ll realistically fetch in trade right now? If he were cost controlled or had multiple years of control left (like an Adam Eaton or a Jonathan Lucroy when he fetched a lot a couple years back) he’d get a kings ransom. But he’s not; he’ll cost a significant portion of a team’s payroll in 2018 and gets just one year of service. And then there’s this: why does anyone think this ownership group will trade him?? For many years, we’ve asked why the Angels hold on to Mike Trout and “waste” his talents on a sub-.500 team. The answer is always the same: the owner in Los Angeles doesn’t want to move his marquee asset. Why does anyone think that the Lerner group isn’t thinking the same thing? Baseball is still relatively “new” in this town, still fighting it out for the casual sports fan. What kind of message does it send to the casual fan base if you move your most marketable asset? Who else on the Nats is getting goofy TV spots with national telecom companies? So, no, the team isn’t trading Harper, nor should they. Instead they should be doing *everything* they can to win in 2018 before he (and many others) walk out the door. And (lets not forget), while I think its a certainty that Harper is in NY or LA in 2019 … we also were pretty sure Stephen Strasburg was heading out the door too, so you just never know. Collier also expresses similar exasperation at the number of these questions he’s getting, then re-iterates many of the arguments above. Q: You don’t list Adam Lind as a possible signee. Why not? Is it that Brian Goodwin can fill that role … but who is the backup first baseman? A: I think Lind could resign … similarly to the way that Stephen Drew thought he could parlay his successful 2016 into a starting gig for 2017, Lind probably thinks the same. Finding veteran bat-only beefy 1B/PH types on the open market is not tough; the Nats have specialized in this for years. So they’ll do what they always have done; wait out the market, sign someone on the cheap later in the off-season if they get desperate, or otherwise have a cattle call in spring training for the backup bench bat. Adam Lind: great in 2017 (.303/.362/.513): can he repeat that in 2018? Tyler Moore: fantastic in 2012 (.263/.327/.513), then a combined .216/.264/.362 over PT roles the next three seasons before finally getting cut loose. And some of these guys never even had a “good” season (ahem, Matt Stairs). So, perhaps the smart thing to do is to let Lind go (as well as Albers for similar reasons) and try some one new. Goodwin as a backup 1B?? No, that doesn’t make a ton of sense (he’s only 6’0″ and is an outfielder by trade), but he could feature as a backup outfielder easily enough. Honestly, the “backup 1B” if Ryan Zimmerman goes down for any length of time probably is Daniel Murphy, with his position getting covered by Wilmer Difo. Collier notes that it was the Nats who declined their part of the $5M mutual option, which somewhat surprised me honestly. I would have thought it would have been the player to decline that and shoot for something more. Nonetheless, it makes the odds of a reunion a bit lower. Q: Can you do a bit of an explainer about the new luxury tax rules, where Nats are with respect to threshold right now, and how that’ll inform Rizzo’s offseason (speculating anyway)? A: Without going into it in great detail (I have a post about Nats payroll coming soon), right now as we stand I have the Nats 2018 payroll at about $170M in “real dollars” (counting arb estimates and deferred payments), but about $10M higher in the eyes of MLB’s luxury tax calculators thanks to the Strasburg and Scherzer deals. The team broached $190m with last season’s mid-season transactions and thus became a luxury tax spender for the first time (which will cost them significantly if they were to go after a QO-attached free agent, not that I think they will). The luxury tax threshold for 2018 is $197M (see this wikipedia page for the link and figures). So, I suppose the team has about $17M or so of “wiggle room” for transactions this off-season plus next mid-season. That isn’t a lot, and all the high-priced players on our payroll are either key pieces or immovable (thanks Matt Wieters). So unless they swing a huge salary, or trade some young assets in payroll-offsetting moves, I think the team will do very little this off-season. Q: Last year, the four top outfielders were out due to injuries for extensive periods of time. Shouldn’t they have six top-notch outfielders to draw from next year? A: Easy to say in theory, harder in practice. You generally only care 4 or perhaps 5 outfielders on a 25-man roster … so how do you make an argument to your 5th and 6th “top-notch” outfielders that they have to hang out in Syracuse for half the season until they’re needed? Not to mention options statuses, 5-year veteran limitations and other things that get in the way of stuff like this. This isn’t the 1950s when you could just stash players all over without regard to service time issues. Starting OF of Eaton, Taylor and Harper. 4th and 5th outfielders Goodwin and Stevenson, both prospects that we developed and being paid the MLB min. 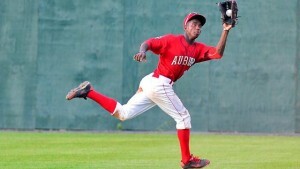 6th outfielder in the name of Victor Robles, who is just one of the best prospects in the game. 7th and further depth still with the likes of Bautista or perhaps the Cuban Yadiel Hernandez who is 30 and could be closer than we think. We have Jose Marmolejos on the roster still; couldn’t he fill in at LF even if he’s primarily a 1B? And then there’s further-away prospects like Daniel Johnson, who hit pretty well between Low-A and High-A, seems like he’ll start in AA in 2018 and might push his way up. That’s not too bad. Btw, how good defensively is our OF projected to be in 2018? Eaton at a corner in 2016 was one of the best in the majors, Harper has consistently been a positive-metric fielding RF with one of the best arms in the game, and Taylor just showed how statistically he rivaled the best defensive center fielders in the game. You can’t discount this fact, and it will show itself next year as more fly balls are turned into outs. Collier likes where our OF depth is. Q: Why should we believe in Dave Martinez? What makes him different ? A: I have not weighed in on the manager selection yet. I thought firing Dusty Baker was a mistake, and that the team did not need to break in a new manager in the critical transition year of 2018. Nonetheless, Martinez does click some boxes for me; he was a successful player with a long career and can command respect from even the veterans on this team. He may not have direct managerial experience, but 10 years as Joe Maddon‘s bench coach is nothing to shake a stick at. He had interviewed for vacancies for years, and deserved a shot. Details of his contract show that he’s severely under-paid and this probably factored into the team’s decision to hire him (for whatever reason, this team remains “cheap” at the manager’s position), but I think he can do the job. What makes him different? Well, he’s clearly learned the “ropes” of managing underneath the game’s best, and in that position he would have had many opportunities to evaluate Maddon’s decisions, privately decide what he would have done, and then seen how things play out. So he should be able to take the best of what the Cubs are doing and augment those experiences with those opinions he had that were not necessarily taken but which he believed were right. I’m hopeful that his regime will go well. Collier notes the points above, but also very fairly says that in reality we have no idea how he’ll manage here since he’s never done so before. Sorry for the break in action; i’ve had a difficult month. And we’re actually on vacation this week, which means we missed last night’s Game of Thrones, which means I’ve got to avoid a dozen different outlets I normally read on Mondays and Tuesdays so as not to spoil it for myself. But I did see that Mlb.com Nats beat reporter Jamal Collier put out a mailbag, and since i haven’t put up content in a month or so, I thought i’d do a response while the kids slept. Here’s the questions he took and how i’d have responded. Q: Updates on the remaining DL members and timing? Who are likely to be September call ups. A: I’m not going to speculate on the exact days these guys will come back, just note that this team has gone 7-3 in its last ten games, 13-7 in its last twenty, and 18-12 in its last thirty games despite leading the league in D/L spots, having their entire opening day outfield on the D/L, and having 3/5ths of their original rotation on the D/L. That’s patently ridiculous. When they get their team back, it’ll be like they went crazy at the trade deadline. A better question might be who makes the playoff roster if everyone is healthy … because guys like Howie Kendrick are going to make it tough for some long-time players to make that roster. A post for another time. I’m guessing the team re-calls everyone save Voth, Read and Marmolejos. Voth hasn’t merited it with his performance this year and both Read and Marmolejos may just be too young. Q: If Werth comes back and doesn’t hit, do you think there’s a possibility he becomes a bench guy with Howie/Lind in left field? A: Absolutely yes. As I alluded to above, Kendrick may be putting Werth to the bench. I can’t imagine the team insulting him and leaving him off the playoff roster, not while he has a career .924 OPS in the playoffs. Adam Lind will not be the starting LF, not in a playoff situation. You need a real outfielder, not a lumbering pinch hitter. I know that I often call for “hiding” a guy out there … but Lind is a stretch even by my theory. Collier thinks there’s no way Werth doesn’t retain his starting spot, unless he’s clearly still hurt. Q: Is there any chance that Adam Eaton can come back from his injury late in the postseason? A: No chance. ACL tears are a year long recovery and then another year past that to regain the confidence to turn on the knee. He may be optimistic with his rehab, but (following up on the previous question) there’s just no way you’d weaken your bench for a guy coming off an ACL tear. Q : What is your guess on the post-season roster assuming full health except for Eaton? A: we’ll save it for a separate post. Collier gives his and its similar to what i’d probably go with. Off days seem to be accompanied by mail bags. And that’s good, because i’m kind of in a writing lull. I have no interest in looking at the hundreds of players in the game and trying to write one of those speculative, useless “hey we should make this trade” posts. So here’s MLB.com nats beat reporter Jamal Collier‘s latest mail bag and how i’d have answered the questions he took. Q: With the A’s trade and Robertson traded, do you think the Nats still look for a closer? 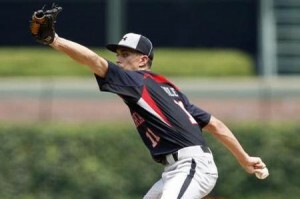 Or do they go for another bullpen piece (ie Neshek)? Ok: here’s who is for certain selling: Detroit, Chicago WS, Oakland, NY Mets, Miami, Philly, Cincinnati, San Diego, San Francisco. And here’s who probably should be selling: Baltimore, Toronto, Atlanta, maybe Texas. That’s 12-13 teams, some of which have pretty good closers. So there’s some arms available. But at what cost? Does anyone want to stomach the trading of yet another set of higher-end prospects for a rental “proven closer?” I’m hoping the team goes a different direction, with a trade of lesser quality prospects for another couple 7th and 8th inning guys. Bullpen now: Doolittle, Madsen, Albers, Romero, Perez, Blanton and Grace. Lefty heavy, and Blanton just cannot seem to get it together. So another righty to replace Blanton could work, given how bad he’s been this year. Maybe the return of Glover or a healthy/effective Kelley is what the team really needs instead of another trade (because who else on that current list of 7 do you want to jettison?). Collier says that the team added a lot of payroll and may not do another blockbuster. Q: Will the Nats make a push for a fifth starter at the trade deadline? A: Nope. They’ll give Edwin Jackson starts until he gives them a reason to dump him, may try existing internal solutions, and will eventually call up Erick Fedde to try him out too. But they seem likely to cull the veteran 1yr FA market next off-season instead of overpaying now. Of course, that being said seemingly the next available option in AAA (Jacob Turner) just got absolutely shelled (1 2/3rds innings 6 runs) … maybe he had transaction-lag from being activated and DFAd within like a 24 hour period. A.J. Cole seems to have nearly exhausted his effectiveness as a starting pitcher; wow how far has he fallen. Hill and Voth both now demoted to AA, along with Greg Ross. 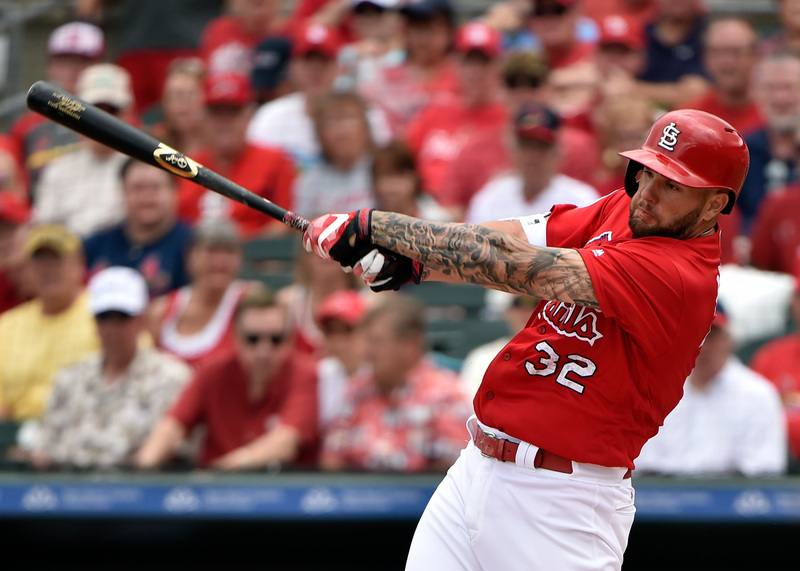 Q: Who are the tradeable assets on the big league squad & in the minors? Likeliest to be dealt? A: Hmm. Most tradeable assets (outside the obvious all stars/marquee players we’d never move) on the big league squad might be Taylor and Goodwin thanks to their excellent seasons, and Gio Gonzalez who has pitched great and has two more option years. But now that Ross is on the shelf for a year, we can’t possibly trade Gio. Eaton should be back in 2018 so there’s no room for both Goodwin and Taylor; i’d guess they’d trade one of them and let the other start in LF after Werth plays out his contract. That is unless the Nats seek to improve offense in LF (like I think they should) and go for a big bopper … then they might have two OF trade assets (I think i’d rather move these guys than have them sit to be the 4th option). In the minors? Andrew Stevenson comes to mind as someone who might be surplus to requirements in the short term and be someone worth flipping. That is unless we move both TAylor and Goodwin; then he’d make a perfect 4th OF for 2018 behind a LF FA acquisition. Past that? Its pretty empty in AAA and AA, so you’d be looking at guys in Low- and High-A as trade assets. Perhaps even lower; we have a number of high-dollar IFAs in the GCL right now. Collier doesn’t even speculate; i guess he’s not a minor league guy. Q: Will Koda Glover close games when he returns? A: Lets get him to return first. Is there even a time table for him to return? Honestly I was almost assuming he was done for the year. If he does return … then yeah, absolutely he’s in the closer mix. Collier says the same thing basically. Q: Any word on Davey Lopes return? A: didn’t even know he was gone. Its been a busy summer. Collier has no updates; he’s away on personal matter.